This manually operated impulse machine is ideal for packing all kinds of products in a limited work space. When using tubular foil, it will be possible to make different bag sizes using the shielded cutting device to trim off any excess foil length. The timer assures the requested seal time. The machine is easy to operate by pushing down the vertical closing sealing arm. A green light indicates the cycle time which is needed to make a good reliable seal. By releasing the arm, the cycle is finished. 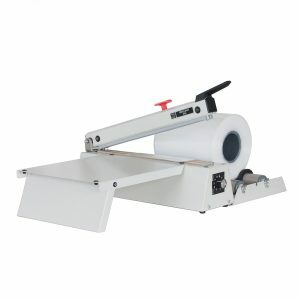 The machine can work with all kinds of thermoplastic films (polyethylene, polypropylene and thin laminates). This twin seal version is equipped with two parallel sealing bars for an extra secure seal.